If we go out for lunch there's a very high probability we are with Geoff and Ashley. This was no exception as they invited us to join them at the newly opened Bleeding Heart Bakery (new to West Town, original on Belmont). I've heard only good things so I was excited to check out the very colorful and large bakery and brunch spot. As with most sunday brunch places, Bleeding is very kid friendly and was a great spot for young Caleb to join us. The menu is great with plenty of options up and down the menu from sweet to savory to lunchy and everything in between. I was in a sweet mood and ordered the pumpkin waffles with bourbon maple syrup. 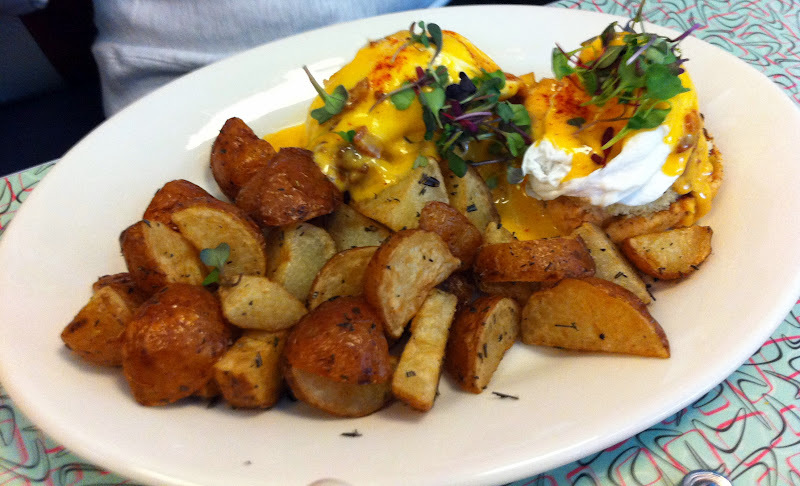 Erica ordered a veggie omelet, Ashley chose one of the many eggs benedict options and Geoff went with granola. 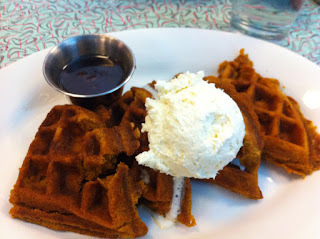 I really loved my waffles and the pumpkin flavors were perfect with the bourbon syrup. I was by far the first person to finish. That allowed me to graze on Erica's plate and try some of the tasty potatoes and a bit of the omelet. It wasn't my favorite omelet but I rarely order them anyway. No one else left any food so I assume my waffles were not the only delicious item consumed. My first and only visit to Bleeding Heart was very good and one I would recommend to others as well as return. The bakery also looks great and could be a source for future baked goods. Just one more great brunch addition to the neighborhood.